Of the three blade style shredders that we have reviewed, this Draper 35900 model, is one of the most expensive. Buyers rate this one on average with a 64% buyer satisfaction rating. That is considered to be an average rating, but we think not good enough for such a high price tag. The other two blade versions that we have reviewed do better in terms of higher ratings. They are also cheaper options. Those are the Dirty Pro garden shredder and the Bosch AXT Rapid. However, some people like the Draper brand, so we have included this one and completed a review. Below we have done a very short summary for those of you who are in a hurry, and simply want the basics. In addition, underneath that brief summary, is a much more detailed review of this Draper blade garden shredder. We have never used this shredder so we can not make any personal type of review on this 35900 model. What is more important anyway is what the real life buyers of this model do say. that is why we have included this information just below. Many UK buyers like the Draper brand. They are a family run business who have been in the UK for over 90 years. Their general range of tools are well made and also affordable for most people. There are enough reviews available for this product, to be able to summarise them and see what buyers did and didn't like. We have summarised the key findings for the buyer's reviews. These are shown below with both the pros and the cons. The blade is reversible, and can be sharpened and that does add to the life of it. Overall the ratings are disappointing when compared to other shredder brands and models on the market. The key complaint, that is consistently repeated by about 13-15% of all buyers is that the shredder struggles to chop anything up, and continually clogs up. There are two types of shredders available on the UK market. Those are a blade type and the other is a crushing style (burrs). The burr style is just so much better but also so much more expensive. Blade shredders, including this Draper 35900 model just don't get great reviews. This type of blade shredder is OK for doing what we would call fine work a few times a year. So small twigs, stems and sticks it will handle OK, but anything bigger than that, and this type of blade shredder will simply just struggle. The blades on these type of machine are just not that strong, and they will struggle and burn out if you attempt to put anything thick through them. These shredder types are all but useless at dealing with anything green. With a crushing style it can get a good grip on green leaved branches and to to work on them. Blade shredders really struggle with the sap inside and end up half cutting them. That is what causes a lot of clogging. The container on this one is poor so might be worth buying something better. Hopefully we have provided you with more than enough information. 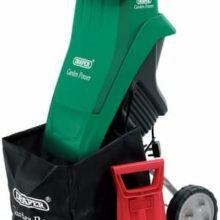 As blade shredders go the Draper 35900 appears to get just OK reviews. As we mentioned earlier, none of us have used this one, and it would be unfair to make personal comments. All we can do is to summarise what buyers say. We have shown that above, and the sense we get is that this shredder is adequate, without being exceptional. The cable length is short, and the reports on the bag collection are not great. There do seem to be better reviews on the other two shredders in this blade category. The motor is bigger than most of this type. In almost all other blade shredders, you get a 2,000 watt motor. This model gives you 2,400 watts of power, so a tougher cutting capacity.​ This 35900 model has an emergency stop which is a good safety feature. When reading through all of the reviews, we noticed a recurring theme of having to frequently stop and unblock the feed. That would be very annoying when trying to get a job done. People did say it did a good job at cutting and chopping. So as long as you don't mind having to clear this out every now and then, the end result seems to be good. We would strongly suggest that you always wear heavy duty gardening gloves, ear protectors, and safety glasses or goggles. Those two inexpensive pieces will simply keep your hands and eyes safe and sound. With any power tool we always recommend an RCD. If you are using an extension lead to plug your shredder into, then we also recommend using the RCD with that as well.That gives you the best protection should anything electrical go wrong. We hope you found this review useful. 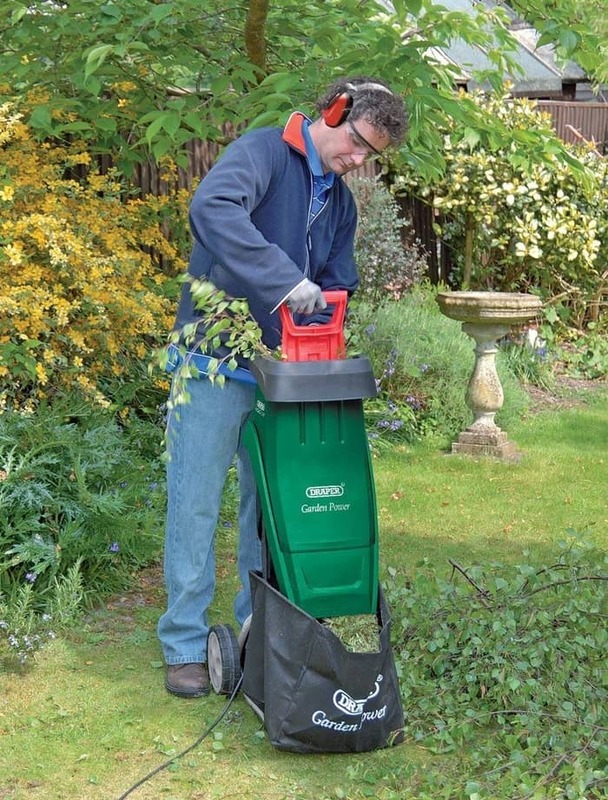 If this Draper model is not the shredder for you, then click here to see the full list of garden shredders. There are many to choose from, and hopefully one to suit your needs.